Why is the UK So Unproductive Compared to Germany? Home All Articles Why is the UK So Unproductive Compared to Germany? Why are British employees so much less productive than Germans when we work an average of 38 days a year more? You've probably heard the quotes about productivity in Britain. Let's just say that when it comes to making efficient use of our working time, we're not exactly at the top of the pile. 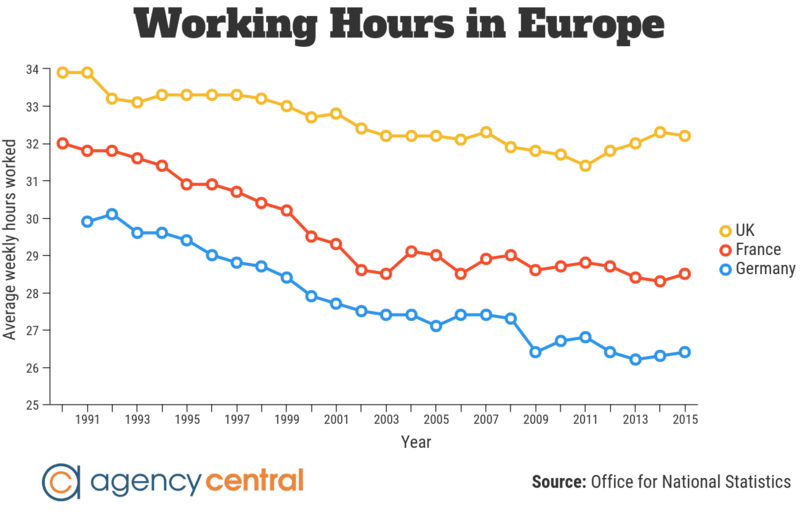 But why is British productivity so low, and how do our neighbours manage to beat us so resoundingly in this regard? Agency Central recently took a look at what UK companies could achieve by switching to shorter working hours - but is burnout the sole reason for the country's productivity problem, or is there something else eating us up? In 2015, Professor Jon Van Reenen, head of LSE's Centre for Economic Performance, said that if British workers could be as productive as those of Germany or France, we could take every Friday off and still earn the same amount of money as we do now. Hiring multiple low-skilled / low-paid workers to carry out a task is an inherently inefficient process. So labour productivity shows us how much money (GDP, or 'gross domestic product') a country makes for each hour one of its citizens works. As the National Living Wage is likely to mean less overall hours worked and increased employee motivation, it is likely to have a positive effect on labour productivity. Why then, you might ask, doesn't labour productivity simply drop each and every time there is a recession and less money is being made? Well the answer is that it would, but a recession is likely to entail layoffs - people losing their jobs. So while unemployment will probably grow during a recession, productivity (speaking in a very broad sense) should remain reasonably constant, as less hours are worked overall. Technological progress.Worker skill level.Worker health.Worker morale.Labour cost.Legal structure governing hiring and firing.Infrastructure of the country concerned. How does technological progress affect productivity? Technological progress is a fairly obvious factor where productivity is concerned. A prime example of this was the Industrial Revolution of the late 18th / early 19th century. During this period, Britain became many times more productive, thanks to technological advancements in areas including steam power, textile working, and metallurgy. It is obvious that an unhealthy worker will be less productive, and work to a lower standard than they would if they were fit and well. More recently, technological development has continued, with devices such as smartphones and computers now ubiquitous across every business. In fact, it is difficult to think of a way business could be conducted on the scale it is presently in the UK without this kind of technological assistance. How does worker skill level affect productivity? Technological progress in the workplace means nothing if workers are unable to utilise it. While many technological developments have led to traditional skills and crafts all but dying out (the internal combustion engine mostly got rid of the need for Horse and Cart Drivers, for instance), others have opened up new avenues for workers' skills to shine (like computer programming). In Britain today, we are facing skill shortages in construction, as well as in STEM occupations and other industries - which is almost certainly affecting productivity in these areas. While foreign workers can often be brought in to cover any shortfalls in staffing levels, this complicates the recruitment process, so may not be possible in a timely manner. Shrinking levels of real pay, coupled with the other problems described here are hardly a recipe for an improved GDP. In this vein, it is important that a country's education system is effective at training a full range of skilled workers, to ensure that the next generation has the requisite skills to help expand productivity further. This is exemplified by Germany - a country renowned for its quality engineering. With emphasis and even cachet placed on vocational training and a wide range of apprenticeships in Germany, the country's engineering sector goes from strength to strength each year. Although engineering recruitment agencies in Britain do a sterling job, they cannot fight against a lack of homegrown talent. If Britain wishes to strengthen its STEM industries, then education must be at the heart of this. How does worker health affect productivity? The importance of worker health in ensuring economic productivity can hardly be overstated. It is obvious that an unhealthy worker will be less productive, and work to a lower standard than they would if they were fit and well. 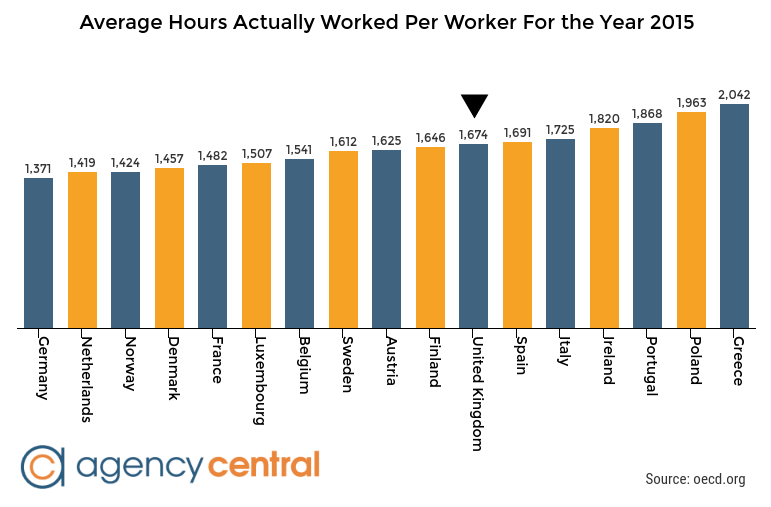 On average, British workers worked an extra 303 hours in 2015 compared to workers in Germany. Based on an eight hour working day, that's around 38 days extra! Further to this, research suggests that the erosion of the traditional 9-5 working day now means that a typical UK Office Worker may cook as few as three meals from scratch each week. Poor nutrition, combined with the sedentary working lifestyle encouraged by many employers gives real cause for concern in a nation where levels of diabetes rose by 65% between 2006 and 2016. Clearly this is a poor foundation for productivity. How does worker morale affect productivity? Closely linked to health is the issue of happiness in the workplace. Although it has long been known that happier workers are more productive workers, employers have often lagged behind when it comes to providing a positive atmosphere for their employees to work in. Things are changing (and many progressive firms now expend considerable resources improving working conditions in their facilities), but problems such as long working hours and inequality are, if anything, worsening in the UK. When workers struggle to commute to their jobs within a reasonable timeframe even in major cities, an extraordinary amount of stress is produced. 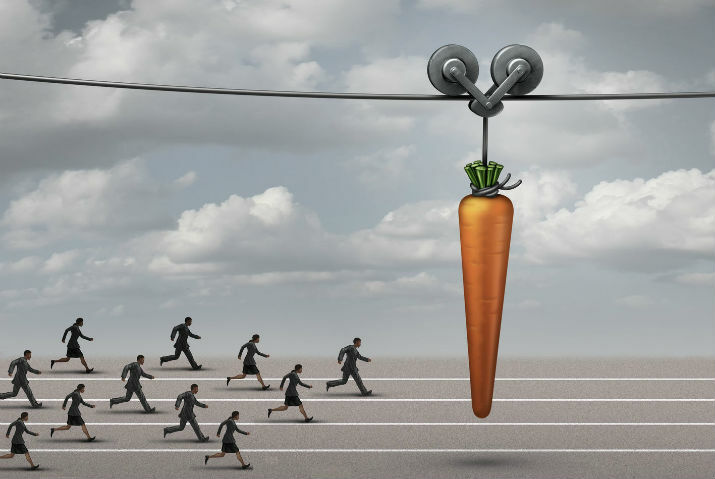 Pay levels will always be a contentious issue in HR, but if one thing is for certain, it's that money is a great motivator. It is after all the sole reason that the majority of employees turn up for work every day. Unfortunately, salaries are stagnating in rich countries even as their economies grow, while inflation rises - meaning that many people's spending power is actually decreasing. Anyone can see that shrinking levels of real pay, coupled with the other problems described here are hardly a recipe for an improved year-on-year GDP. How does labour cost affect productivity? Because productivity tends to be calculated using the labour productivity method described earlier (where labour productivity equals GDP divided by the total number of hours worked), the cost of labour can heavily affect the calculated result. If labour for a particular job role is especially cheap, it may seem more cost effective for an employer to simply hire multiple staff to carry out a task - rather than helping existing staff to become more productive through (expensive) training or improvements made to their working conditions. But theoretically, by increasing levels of low quality employment in this way, employers also increase the total number of hours worked - without increasing the GDP produced. Labour productivity is therefore lowered. This means that (in these terms at least), hiring multiple low-skilled / low-paid workers to carry out a task is an inherently inefficient process. Another factor likely to affect the labour cost situation in the British context is the National Living Wage. The National Living Wage represents an increase in the cost of hiring labour for employers (or an increase in pay, depending on your perspective). As the National Living Wage is likely to mean less overall hours worked and increased employee motivation, it is likely to have a positive effect on labour productivity - although this remains to be seen. How does the legal structure governing hiring and firing affect productivity? Following on from the cost of labour, is the issue of how the labour market is regulated. As we mentioned at the beginning of this article, a recession should not generally mean a fall in labour productivity. Rather, in the unforgiving world of modern employment, a serious economic downturn is more likely to mean redundancies, and either a fall in output, or remaining employees being forced to work harder in order to keep their jobs (increased efficiency, at least in the short term). This shows that government regulation of the labour market is an important factor where labour productivity is concerned. If the government makes it more difficult for employers to recruit or make employees redundant, then firms cannot react to economic situations in the same way they might otherwise. Clearly, if levels of profit are to rise year-on-year, something has to give. Some British employers (Sports Direct, for instance) have been known to use so-called 'zero hours contracts'. These contracts work by allowing employers to forgo any guarantee as to the number of hours their employees will be working in any given period. Although in theory zero hours contracts are likely to result in an increase in labour productivity due to more efficient staffing (problems of overstaffing can be easily solved by the employer), the negative effect they are likely to have on worker morale and even health cannot be understated. With around one million workers affected by zero hours contracts as of late 2016, this form of employment has become a highly politicised issue in the UK. Criticisms of zero hours contracts range from the difficulties they place workers under when attempting to plan their lives, to the lack of holiday or sick pay they often afford, as well as the negative effect they have on levels of motivation. Once these secondary factors are taken into consideration, it's easy to see that the impact zero hours contracts have had on UK productivity may not be entirely positive. How does infrastructure affect productivity? A secondary factor that can affect a country's productivity is its infrastructure. Not only do amenities like effective transport links mean that products and materials can be delivered to their destination on time and on budget, they also allow for higher worker morale (and consequently health), as described above. Although it has a rail network sometimes referred to as 'the worst in Europe', and extortionate fares, Britain's roads are little better. Compared to other countries in Europe where productivity is generally higher (Germany being the obvious example), Britain's underinvestment in transport infrastructure is painfully apparent. The majority of urban areas outside of London are still without trams or underground train systems, and even within the capital itself, mass transit systems strain under the pressure of the daily grind. Britain has come to rely on the service industry for much of its employment. When workers struggle to get to their jobs within a reasonable timeframe even in major cities, an extraordinary amount of stress is produced, and the working day is further extended. As we have already seen, stressed, tired workers, are seldom productive workers, so Britain's poor transport network is more likely to have a destructive effect on productivity than one might assume. This effect is compounded by Britain's housing situation - with many workers priced out of certain areas if they wish to build equity by purchasing a place in which to live (with London easily the worst, but by no means the only affected area). Often, employees are faced with a stark choice between renting an expensive property close to their place of work, or getting a mortgage on a more affordable home further from work and commuting in - with all the added costs that entails. So-called 'super-commuters' now undertake mammoth journeys in order to reach the capital - underlining the magnitude of the housing crisis. Many people are now moving north from London, to escape the rapidly-increasing cost of living in the south-east. Ok, so why is Germany more productive than the UK? 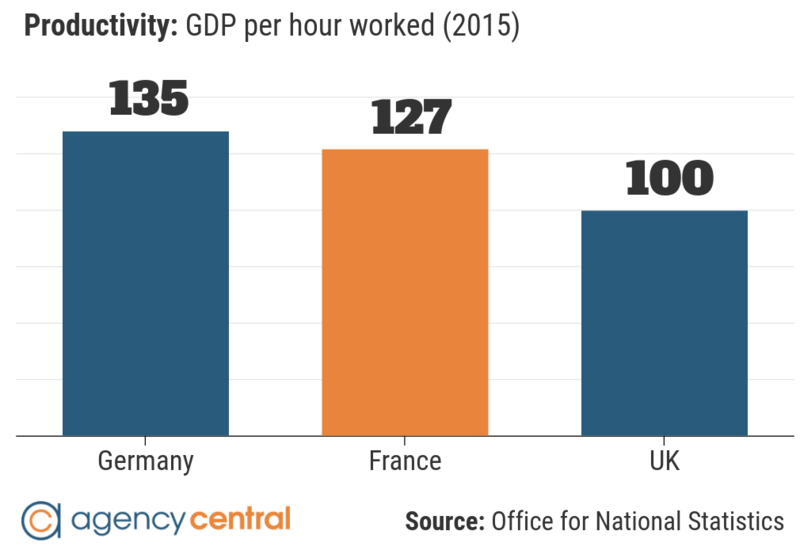 Ok, now we know what productivity is, and we've seen where the UK's problems might lie - so now let's consider why it is that Germany manages to win so resoundingly at this game. Is Germany more productive than the UK? 'German efficiency' is a phrase heard so often that it's a bit of a cliche nowadays - although you'd be wise not to mention it to the representatives of certain automobile manufacturers anytime soon! If you're from the UK, then how much of your time at work is spent drinking brews, chatting with co-workers, or reading the news? Go on, be honest - we won't tell. Well that's more or less what happens in Germany. Is this making sense yet? Germans work hard; really hard. But they are rewarded for that with much shorter working hours than what we have here in the UK. Direct communication and diligence are prized in German working culture - as are family life and free time (Freizeit). Idle chit-chat and break-time are not - and are heavily frowned upon. To illustrate just how deep this goes, the German government has given serious consideration to banning bosses from contacting their employees outside of working hours, and the country's parental leave (Elternzeit) laws are among the most generous in the world. Elternzeit gives equal rights to both parents, with 12-14 months of leave, paid at 65% of net monthly earnings (Elterngeld). German average weekly working hours decreased from 29.9 in 1991 to 26.4 in 2015. Britain's have gone from 33.9 to 32.2 in the same period . See further comparisons here. Could it be that shorter working hours, good working conditions, and high productivity all go hand in hand ... ? As well as efficiency, Germany is stereotypically known for its engineering - so it might come as no surprise that investment in this sector is high. Consider, for instance, the fact that for every 100,000 people in Germany, 1,034 work in research and development. In the UK, that figure is just 883 per 100,000 - around 15% fewer. You literally can't have new technology without doing research and development, so this is an important indicator of how much the sector is likely to grow in the near future. Of course investment in research and development goes hand-in-hand with having strong engineering and manufacturing sectors to begin with - and with homegrown businesses including the likes of BMW, Bosch, Siemens, and Volkswagen, Germany has had this for a long time. Unfortunately it appears that it may take a calamity before any real progress is made with the UK's productivity. Conversely, as a country that went from supplying around 25% of the world's manufacturing exports in 1952, to just 2% as of 2013, Britain has come to rely on the service industry for much of its employment. While manufacturing shrank from employing 36% of England and Wales's population in 1841 to just 9% in 2011, the service industry grew from employing 33% to a staggering 81% over the same period. Although this transition benefited the country at a time when its manufacturing was in decline, the service industry is inherently less productive than sectors involved with more tangible products - which might go some way to explaining the country's present situation when compared to industrial powerhouses like Germany, or even France. Industry in Germany has a long history of cooperation with its shop-floor workers. This allows for strong production and productivity figures, while still maintaining good working conditions and levels of pay. A statistic quoted in the US context is that Germany produces twice as many cars while also paying the people making them twice as much. In addition to this, Germany's Mitbestimmungsgesetz law requires companies of a certain size to have supervisory boards made up of no less than 50% representatives of workers. This has helped to avoid situations where executive pay has spiralled out of control at the expense of the company and the rest of its staff (although executive salaries in Germany are on the rise). The UK and Germany are two very different countries with very different economies and historical backgrounds. Although the levels of productivity seen in parts of mainland Europe are attractive - and there are many lessons that UK companies could learn from those in Germany especially - many of the factors leading to this would be unlikely to be directly transferable across the North Sea. It's unlikely that there will be a clear resolution to the UK's productivity woes - and many of the possible routes toward a solution will be a bitter pill to swallow for proponents of the existing unproductive working culture. There does however exist a tendency toward higher productivity in the economy - certainly among smaller, more dynamic organisations - and this is likely to mean that there is at least hope for the future. Stagnation in the UK's working hours, and inflation-adjusted pay moving backwards on aggregate, tell a different story however - and unfortunately it appears that it may take a calamity before any real progress is made with the UK's productivity. Although the National Living Wage promises a brighter future for many of the country's lowest-paid workers, employer forewarnings of redundancies being made in light of this change mean that its potential effect on productivity may be neutered for the most part. Clearly, if levels of profit are to rise year-on-year, something has to give, but at this point it is unclear what this will be. In terms of labour productivity there are only two variables, and either GDP must rise, or hours worked must fall (with GDP remaining at least constant), in order see an increase.
" ... in the real world, it takes a German worker four days to produce what we make in five; which means, in turn, that too many British workers work longer hours for lower pay than their counterparts. "This has to change if we are to build an economy that works for everyone." We hope you have found this article informative. Look out for our closely-related forthcoming piece where we look at an actionable approach to raising workplace productivity.